Honda's CRF lineup was already a comprehensive set of options... but sometimes you need to do a little customization to get exactly what you wanted. But maybe not anymore, with 3 new sub-models added to the lineup. During a recent "CRF Collective" unveiling ceremony at Fox Racing headquarters, Honda announced its most far-reaching range of performance off-road models ever, expanding the group by three and significantly improving the four returning models. 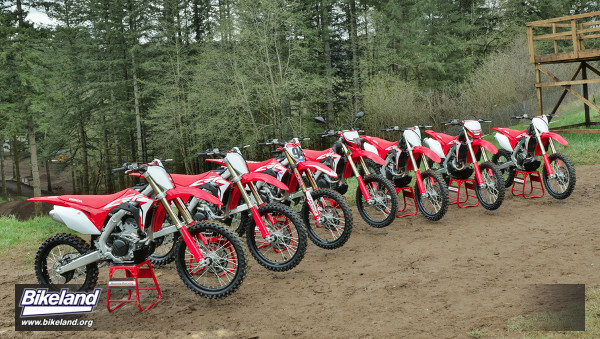 Leveraging the brand's unparalleled experience in the manufacture of dirt bikes, Honda's performance off-road lineup now includes CRF machines for riding applications including motocross, closed-course off-road, pure off-road, and even dual sport.